aden+anais is always a go to for gifting because of the quality and dreamy prints. I am loving my daydream blanket but despite my efforts of keeping it to myself, Kenzie has won over as she always needs a piece for herself. 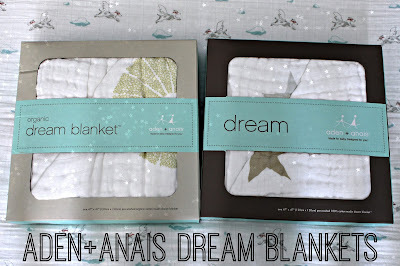 I was excited to receive the aden+anais dream blankets to review for kids. The aden+anais Super Star Scout Classic Dream Blanket is generously sized at 47x47 and great for tummy time with newborns to cuddling with toddlers. It is made of 4 layers of 100% muslin cotton and features a neutral star print that is perfect for the holidays. aden+anais products are fantastic because they only get softer after each wash. Kenzie will be smiling in glee when she opens this on Christmas morning and I will be smiling because my daydream blanket will be all mine once again. The Oasis Organic Dream Blanket is just as fabulous but made of organic cotton muslin. This is perfect for Mason as he can snuggle and play peek a boo. Plus, make sure you pick up one for each child because they can grow with it and hopefully not fight because they have their own special dream blanket. I may have to pick up a second for each for the time when it goes into the wash! Buy It: You can purchase the Super Star Scout Classic Dream Blanket for $49.95 and Oasis Organic Dream Blanket for $69.95. Make sure to connect with aden+anais on Facebook and Twitter! One Winner will Receive an aden+anais dream blanket! i love the makana bamboo daydream blanket and the starstruck organic dream blanket! I like the liam the brave - flying dog classic dream blankets. I also like their hair + body wash skin care . Their swaddle blankets are so lovely! I would also like to have their Mod About Baby - Frog Hooded Towel Set. I would choose the jungle jam - giraffe + white classic Dream Blanket. I like the liam the brave - flying dog classic dream blankets. Thanks so much for the fantastic giveaway! Their sleep sacs look great! We'd love the bamboo blanket. I like the new beginnings gift set. II love the make believe - ragdoll + funny classic dream blanket & the dream in grey cozy sleeping bags! I would pick The Jungle Jam Giraffe dream blanket! I also love the twinkle hooded towel! I'd like the moonlight bamboo swaddles! I love the serenity star system and I would also love the purely plum bamboo daydream blanket-beautiful! I love the tranquility - leafy + white bamboo dream blanket and the sugar plum cozy sleeping bag. I like the branch out daydream blankets and I would love it for my son. I want a few of the classic sleeping bags. Thanks! I love their Into the Woods swaddles, and I would get the Azure Beads dream blanket! I'd love the jungle jam easy swaddle and I'd pick the jungle jam dream blanket. I'd love to have the Mod About Baby - Frog Hooded Towel Set and the Azure Beads dream blanket! The Bamboo sleeping bags are nice! I would like the Up Up and Away Dream blanket. I would like one of their classic sleeping bags. I want the tranquility - leafy + white bamboo dream blankets. I also love the twinkle gift sets. I would love the elephant - for the birds classic musy mate lovey. I love the starstruck organic dream blanket for a boy, but I would choose the Ilium the Brave dream blanket for my kids! Night Owl and Starburst or the Rose Tranquility Bead blankets! I also like the B-jeweled swaddles! I would choose the Giraffe dream blanket. I like the Jungle Jam Elephant Classic Sleeping Bag, and I would choose the Night Sky Owl Starburst Classic Dream Blanket. I like the "makana bamboo daydream blanket"
I would love to try the serenity star. I like the up, up & away - elephant classic dream blanket, I also like the sugar plum cozy sleeping bag. We would ADORE the night sky - owl + starburst classic dream blankets! I'd also love the matching sleeping bag for my little man! He could really use some more soft blankets! He has one of the bamboo blanket sets and he LOVES it. He's on a feeding tube and the only way to comfort him when we replace it is to swaddle him and these are his favorites. Unfortunately he throws up a lot so we have to wash the blankets we have A LOT. lol. It'd be nice to have another one! Thank you for the chance to win! We'd love the classic dream blanket and the swaddle blankets! bamboo daydream blanket and the starstruck organic dream blanket! We would love the snuggle bug organic dream blanket and a cozy plus sleeping bag. My comment disappeared! I would love some bamboo swaddles for the new baby.